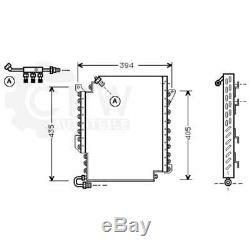 Condenser with air conditioning for audi 80 front 90 cabriolet 8g7 b4. This product page has been automatically translated. If you have any questions, do not hesitate to contact us. 5/8 in - 18 unf. Plug & Play - easy installation with original mounting points. Please check before purchasing the stored original part numbers and the vehicle assignment for the compatibility of your vehicle. As there are various equipment in a vehicle model, the different parts will be installed at the factory. All figures are for rough comparison purposes only! If you do not know if you have chosen the right part, please contact us, we will advise you. These figures are for comparison purposes only. The items shown in this range are generally not original parts unless they are marked as such a usd rücklich. Illustrations and oe-no are for comparison purposes only may differ. Generally all in stock - so no waiting. 24 months warranty on new products. 12 months warranty on the items used. Our service does not stop for you, with the sale of goods. 60035119; valeo: 814288; van wezel: 03005119, 03 00 5119; vemo. Aks dasis: 482010n; alanko: 501009; self air gloucester: 169686. Kager: 945852; nissens: 94817; nr: 35056; SCHLIECKMANN. V15621042; auradia: 102572; geri: 924380; serck-marston: 43497. The item "air conditioning condenser for audi 80 front 90 cabriolet 8g7 b4" is on sale since Tuesday, January 22, 2019. It is in the category "auto, motorcycle parts, accessories \ auto \ parts spare parts \ air conditioning, heating \ condensers ". The seller is "qrparts24" and is located in leipzig.